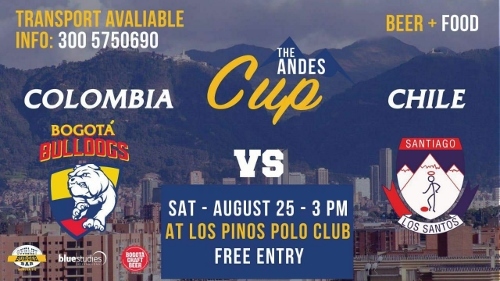 Both the Santiago Saints and Bogota Bulldogs are feverishly preparing for the biggest South American match of the year – the Andes Cup – to be played in Bogota on Saturday 25th August. The Bulldogs are current title-holders and have won the title both years since the inception of the event. However, the Saints have been getting closer and maybe this will be their year. President of the Bogota Bulldogs, Paddy Smallwood, shared his thoughts ahead of the historic clash – the showpiece of Australian football in South America. The event has grown quickly in stature since its inception in 2016. Now the Andes Cup has the potential to drive recruiting in both Colombia and Chile as well as inspiring other South American nations to develop smaller leagues or clubs. With previous forays into the world of Australian football in Argentina, Brazil and Mexico, as well as whispers of things happening in other nations, footy on the continent could potentially take off and some of that will be the impact of the Andes Cup.